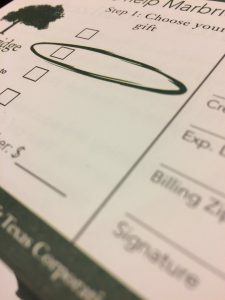 Our agency is housed inside a commercial printer, and this month I’ve been seeing a lot of nonprofit fundraiser letters going through the shop. Some of them make smart use of what’s called variable data, and it sparked my interest in what other clever ways a designer might use this technique. What’s variable data, you ask? 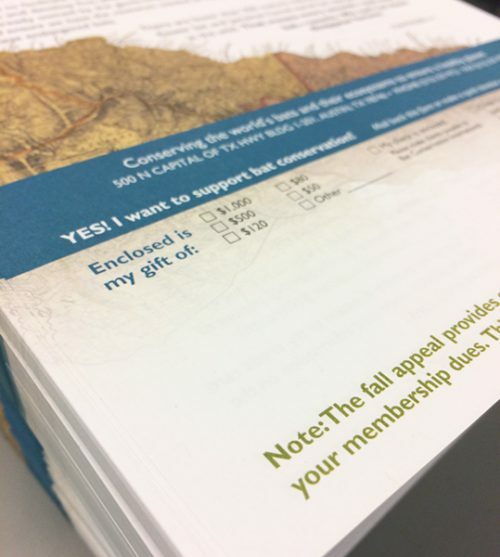 Imagine you’re designing an end-of-year appeal letter for a nonprofit. If you want to open the letter with addressing the person by name—“Dear Margaret,” for example—your printer would do this using variable data. You’d send the printer a spreadsheet that includes every recipient’s first name, last name, address, etc. If you’re printing a lot of letters, your printer will likely run all the common elements (the stuff that every letter will include) on an offset press. These identical printed sheets are known as a shell. They will then use a digital printer to pull the names one by one from your spreadsheet and imprint them onto the shell. A generic shell thus becomes a personalized letter. The thing is, you don’t have to stop at just addressing each person by name. You can customize LOTS of things using variable data, and you’d be smart to do so, because the more targeted your mailing is to each individual customer, the likelier it is that you’ll get the response you want. So what are some other ideas for using variable data? Customize monetary amounts. If you’re designing a donation letter, you could include in your spreadsheet how much each of your existing donors gave last year. You would then create additional columns indicating what the suggested ask amounts would be for this year. For example, someone who gave $50 last year could be coded to be asked for $50, $75, or $100, whereas someone who gave $500 last year could be coded to be asked for $500, $750, or $1000. No one is put off by being asked for too much, but you also don’t miss out on the opportunity to go for the big ask with people who can afford it. You could apply this same idea to discount codes. Perhaps customers who have only placed one order get a code for free shipping (to entice them to build more loyalty to your brand) while people who have placed multiple orders might receive a code for a larger discount. Customize locations. If your business has multiple locations, you can provide an address and map to the recipient’s nearest store, based on where they live. Customize images. You can not only customize text, but also images. Let’s say you’re a bookstore and you want to entice your customers with new titles so they’ll come back into the store. If you have their purchase history, you can sort them by genre so that sci-fi and fantasy fans see the latest Neil Gaiman novel on the front of your postcard, while romance fans see a red-haired lass looking longingly at her muscular paramour. You can also peg the images to demographic information that you have about your list. If your mailing includes images of people your customer is supposed to identify with, have the images actually reflect the gender, age, ethnicity, and so on of each recipient. If they see themselves on the page, they are that much likelier to make the connection that this product or service is for them. There are many other possibilities, and of course these same principles can be applied to digital marketing. Try it out in your next campaign.